Would you like to go down the river Sella with your children? In the mountains of the north we indicate which are the guidelines to be taken into account to enjoy a descent of the Sella with children in a safe and fun way. It is an aquatic activity, so it is necessary to meet minimum requirements, but it is also important to be clear what you are going to do and in what conditions. When you hire an activity, besides knowing the cost and the equipment, there are other details to take into account both for you and for the company where you hire. Optimum level of the river depending on the profile of the participants. Is there a possibility to hire a guide? Is it better for young children to go between two adults? Do you have any illnesses or similar that prevent the correct development of the activity? Number of children and adults. 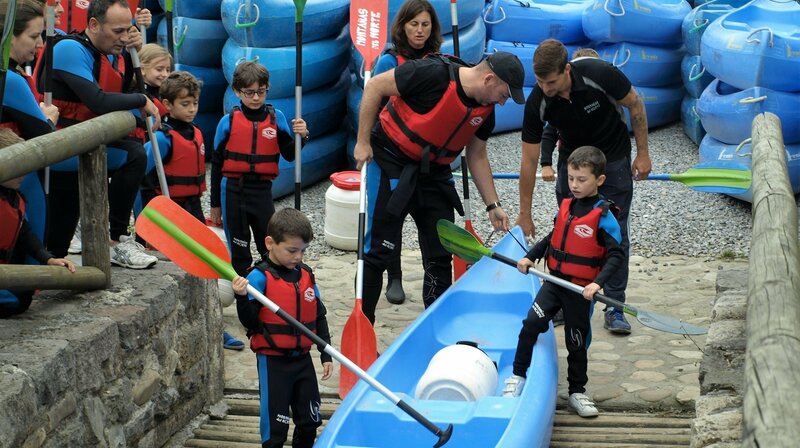 We provide the necessary accessories for you and your family or friends to spend a day of adventure and you can experience the sensation of navigating the waters of the most emblematic river in Asturias in an easy and safe way. Wear the vest tight at all times. Clothing and spare shoes (subject to the foot). Own accessories of the activity. R. C. Insurance and accidents.